wide area from floor to ceiling with only a few degrees difference. area to another while maintaining desired temperatures. view through the opening, eliminating doorway accidents. mixed and circulated with building heat and heat given off by lights and machinery, etc. 2. 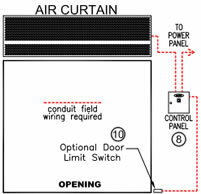 The high velocity curtain of air deflects winds and reduces excessive heat loss through open doorways. the air curtains can be used to prevent loss of conditioned air as well. and connected to electric power source. order to adjust rate of air flow. adjustable air deflectors with 40% sweep front to back. on both ends without any intermediate support. Optional Colors Available - Std. Production Color is Obsidian Black (matte) See add-on prices below. 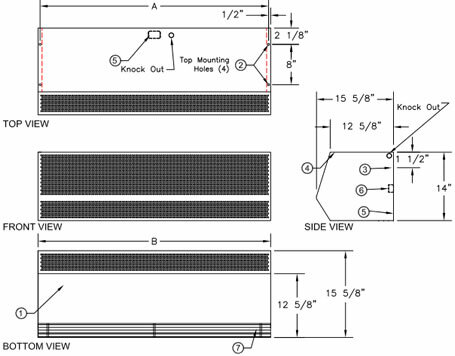 Length of Unit 25" 36" 42" 48" 60" 64" 72" 84" 96" 108" 120" 144"
Click the Part No. of the item you wish to purchase. Door Limit Switch - Combination roller and plunger - 20 amps, 250v, or 1 hp max. Commercial Magnetic Reed Switch with Controller and Adjustable Time Delay - 115v. 6 sec. - 20 min., plastic, surface-mounted. 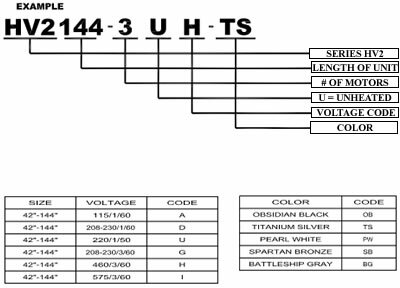 *Add code for required voltage from chart above. (Set of 2) $2.44/per in. Optional Color Available - Std. Production Color is Titanium Silver See add-on prices below. Industrial Floor-Mounted Magnetic Reed Switch Only - Floor mounted. 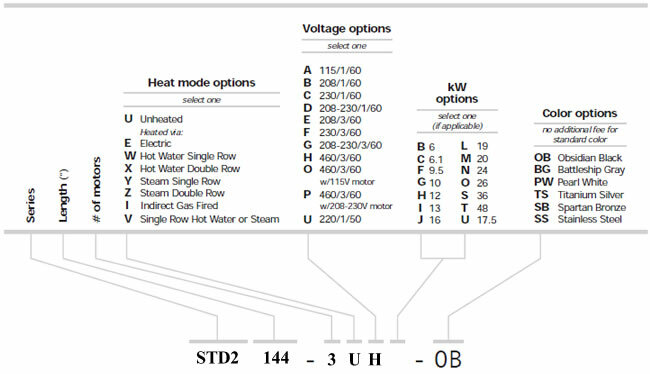 Industrial Surface-Mounted Magnetic Reed Switch Only. Surface-mounted. Note: Control panel required. Units have flange on either end for easy overhead or back mounting. 2. 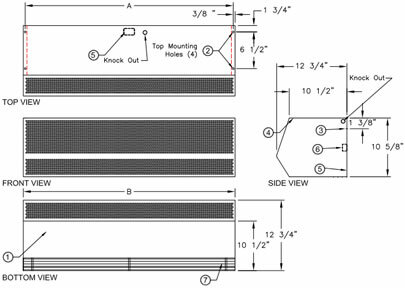 7/16" mounting holes (4) provided, (2) on each end. both ends without intermediate support. 6. Internal J-Box(ex) for electrical wiring. 7. Unit is to be installed such that air flow is unobstructed. vanes with 40° sweep front to back. 8. Optional motor control panel. Overloads are factory set. side of air curtain housing. Please specify. 9. Circuit protection as per NEC by others. that the air curtain turns on as door begins to open. -2, -3 & -4 designates the number of motors. *NOTE: Intake screen size and quantity varies with unit length. 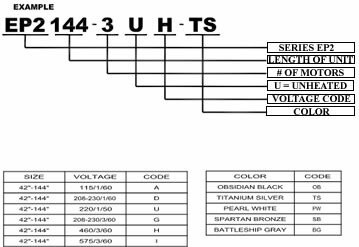 STD2 36-1U 35 1/8" 36"
STD2 42-1U 41 1/8" 42"
STD2 48-1U 47 1/8" 48"
STD2 64-2U 63 1/8" 64"
STD2 72-2U 71 1/8" 72"
STD2 78-2U 77 1/8" 78"
STD2 84-2U 83 1/8" 84"
STD2 96-2U 95 1/8" 96"
STD2 96-3U 95 1/8" 96"
STD2 108-2U 107 1/8" 108"
STD2 108-3U 107 1/8" 108"
STD2 120-3U 119 1/8" 120"
STD2 144-3U 143 1/8" 144"
STD2 144-4U 143 1/8" 144"
terminals in panel per print. & Canada, and bear the CE mark. wall on both ends without intermediate support. 6. Internal J-Box(es) for electrical wiring. -2 & -3 designates the number of motors. on as door begins to open. (8 1/2" x dimenstion B) of the intake face area. 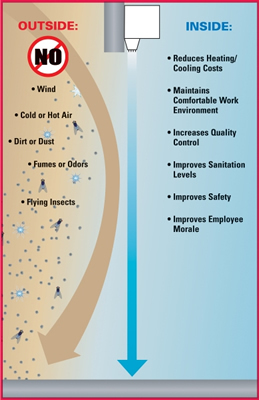 Mars Air Door, Warm Air Curtains, and Insect Barrier from your source for material handling equipment.